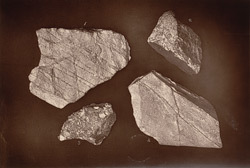 Close view of four rock specimens from St Agnes in Cornwall, taken by J.C. Burrow in 1893. The mineral wealth of Cornwall was exploited on a grand scale during the 19th century, when hundreds of mines operated in the county, extracting copper and tin. This image accompanies a set of photographs by Burrow of Cornish mine workings which document the working conditions of miners in the late 19th century. They were taken underground and made use of the development of flashlight techniques.